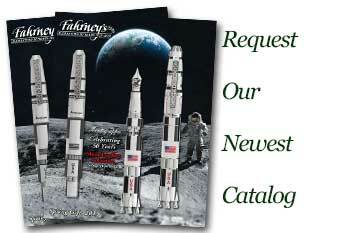 Order your Fahrney's Exclusive Retro 51 Star Spangled Banner Tornado Rollerball today from FahrneysPens.com. Fine Pens, Refills & Luxurious Gifts – great prices & fast shipping. Oh, say can you see? Fahrney’s Pens new special edition ‘Star-Spangled Banner’ Rollerball honors the history of early America. Featuring 15 stars and 15 stripes, the Star-Spangled Banner flew over Fort McHenry at the Battle of Baltimore during the War of 1812. The flag withstood the 25-hour bombardment by the British Royal Navy in Baltimore Harbor. While witnessing the battle, Francis Scott Key was inspired to write the poem “Defense of Fort McHenry”, which later became the words to the U. S. national anthem. Fahrney’s Star-Spangled Banner Rollerball features an image of the battle flag on the metal barrel overprinted with Key’s handwritten lyrics, finished with antiqued silver-tone accents. The special edition pen includes a Tornado rollerball with twist-top activator and is shipped in a custom-designed tube. The companion Star-Spangled Banner pencil can be purchased separately. This limited production pen will show your appreciation for the patriotic story behind the flag and a young nation's struggle for freedom. The Star Spangled Banner twist-top retractable rollerball gives you smooth-flowing ink. It can be switched to a ballpoint by replacing the rollerball with a ballpoint conversion refill (sold separately).